How’s that for a long blog title? 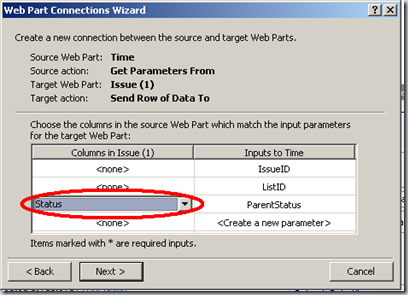 Well, by far my most popular blog post has been about creating a Parent / Child relationship in SharePoint Designer and one question keeps getting asked over and over again: “How do I pass multiple values to the new item screen for the Child?” So, I thought it was about time I actually told you how. :) Are you ready? 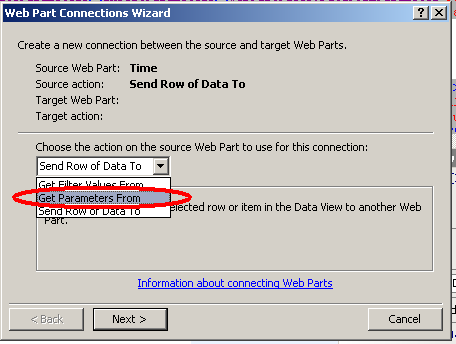 As stated before, this blog is a direct continuation of a previous blog post Creating a SharePoint List Parent / Child Relationship - Out of the Box. So, if you think you are lost, follow the steps on that blog post first, then come back. 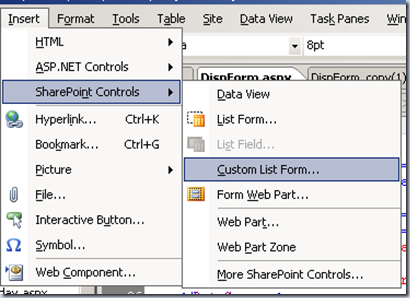 1) Make the default Web Part invisible (in case you are modifying your DispForm.aspx file). Maybe one of you geniuses out there know how to do this in fewer steps? 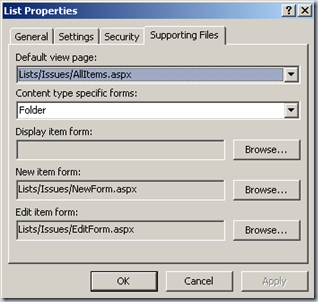 If you are doing your work in the default DispForm.aspx of the parent (Issue from previous blog) then it is necessary to make the default web part on the page invisible. 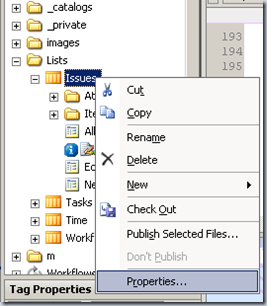 DO NOT delete the default web part. This will break your list views and you will not be able to get them back. 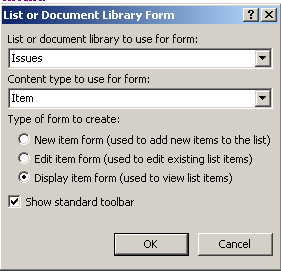 4) Click on the “Browse” button next to the “Display item form” box and point it to your previously created form. *one caveat* I have had very limited success re-associating forms this way. It is SUPPOSED to work fine. 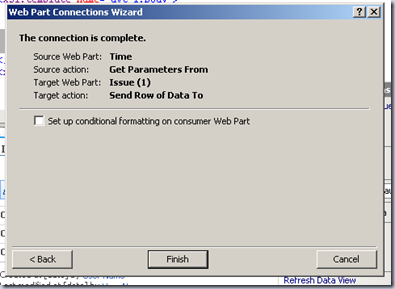 Unfortunately, just because something in SharePoint is supposed to work, doesn’t mean it will. So, I’m going to assume that you are modifying the default DispForm.aspx and we need to make the default Web Part invisible. 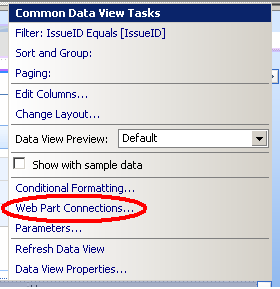 We are doing this so we can add a DataFormWebPart for the Parent (Issue) on the page and set up a data connection between the child and parent. 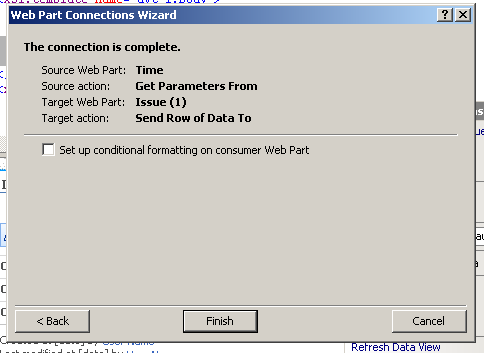 This data connection cannot be set up on the default DataFormWebPart. 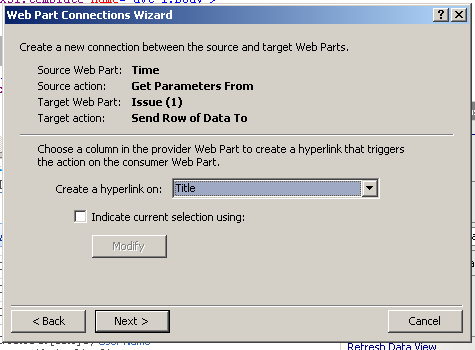 1) Search for the string “true” in DispForm.aspx of the Parent (Issue). How painless was that? 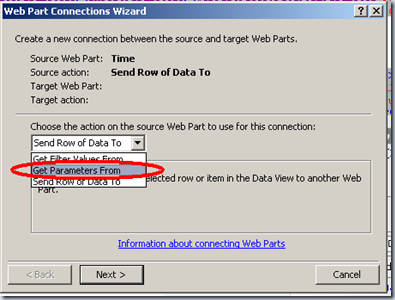 View the page now in SharePoint, you will see that there is no data displayed for the parent item. On to our next step. 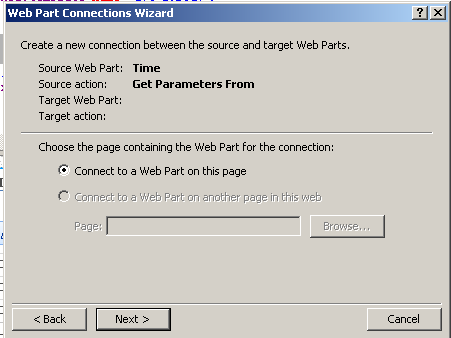 We now need to drop a new DataFormWebPart on the page for the Parent (Issue) Web Part. If you are asking yourself, WHY do I keep putting “(Issue)” after the word “parent”, then you obviously didn’t read my previous post. The parent list in the previous blog was for storing Issues. Got it? Can I stop saying (Issue) now? okay.. thank you. 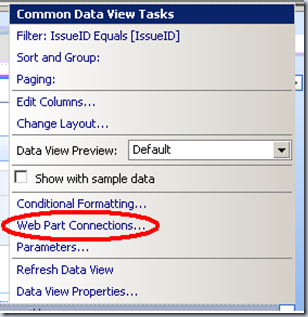 1) In the DispForm page of your Parent list, place your cursor after the ““ line in the aspx page (this is where we are going to put our new Web Part). You will now see the display form for your parent on the page. 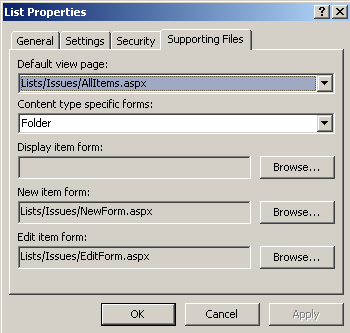 You will notice that this display form differs from the default web part. You have a lot more control from here, you can even go in and modify the look and feel of the Display Form using standard html to make it look nicer. Have fun with that, I’m not responsible for what you break. Okay, so now, let’s get the data from the parent into a parameter that the child can see. 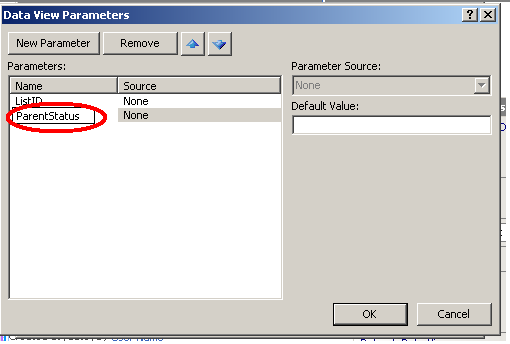 The following steps are necessary to create a parameter on the Child List for the “Status” field in the parent. You can repeat steps 6 – 8 to create more parameters if you’d like. *phew* If you think that too you a while to do, think who long it too ME to capture all the screens and type it in. :) So, still with me? Good! 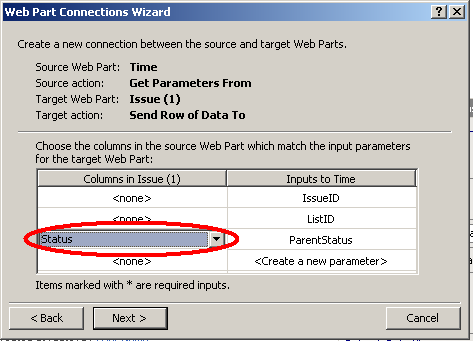 We now have parameters created in our child list that we can pass as Query String variables. On to the next step!!! 1) Go to the link in your code. 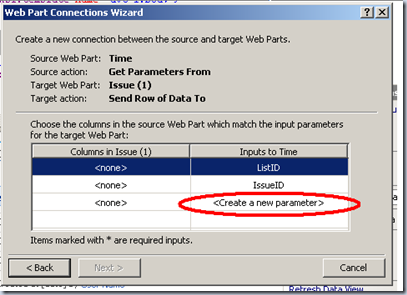 2) Add the parameter as a Query String variable. So, there you have it. Add as many query string variables as you like. Hope this answers all the previous questions, if not. What did I forget? Again, thanks for reading my blog. Hope you learned something useful. I've used your example and it works great except i'm trying to add a button on the "time/child" form to give th euser the ability to add additional entries. Th eissue im having is that when i click the button it doesnt pull the "parent id". It will on th efirst click, just not the ones after that. Hope this makes sense. any ideas? I was looking at this, but is it possible to capture a value of a list (order number) and pass that value to a new form so the person doesn't have to type the order number in again. I'm trying to ad a link to add a new entry to a document library not a list. 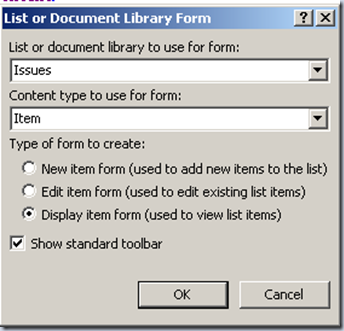 Adding a document is a two step process including two forms. How can I pass a value to the second form? This was incredibly helpful! 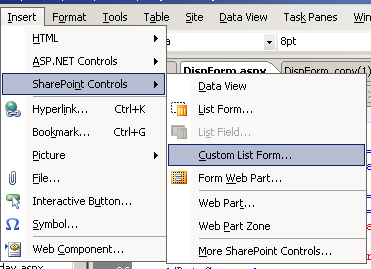 I did not know you could pull parameters from another list just by including it (hidden) on the newform page! 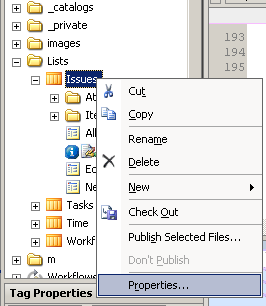 I wish I would have found this thread a week ago when I was trying to use workflows to update my list after the fact. This works much easier and quicker!! Thanks!! Great blog (as was the predecessor to this one) and everything worked fine when I created your exact example. 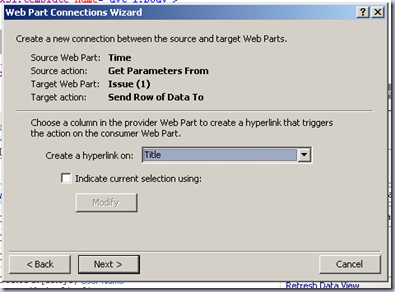 When I tried to create the web part connection in my real-world example the "Create a hyperlink on" dropdown is blank! So of course it won't let me finish creating the connection. I've tried every sort of tweak I could think of to no avail. Does anyone know of any obvious thing that I'm missing? Or any insight? Very nice and useful article. Got benefited. 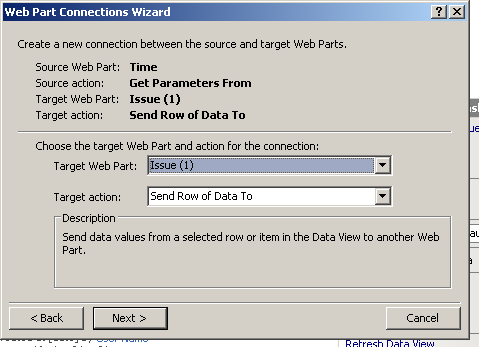 I a working in SP 2010 and using the relationship method by "Insert Related List" method. 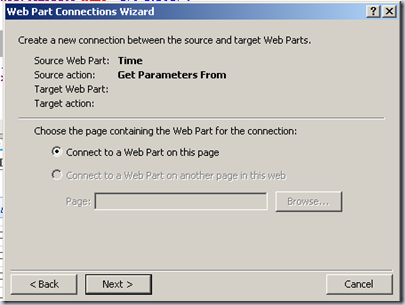 Here when we add a new child page from the link in the page,It does not default to the parent item . Any idead jpw I can accomplish this? i could follow this and previous post and it works great. i pass 1, then 2 variable, all fine. But then i wanted to pass the "company Name" as a variable (No3) and when i do it passes all ok to newitem form, but on save it says: you are trying to write to a cell that is maybe read only status. Although if i do not "pass" the variable upfront, but fill in the field manually, the child new item form posts fine and no error appear. Any clues ? HI Mark, update on my previous post. I found a work around my problem by modifying the target cell on child list to be single line text instead of dropdown. 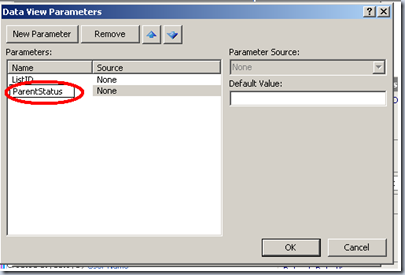 That no allows to also pass "Company Name" variable and save on form. No: Of course advanced users would have known this. When i pass some Company Name that has a & in the name, that name gets parsed and only first bit come over. I am not sure whether my problem is clear, nevertheless i try: any clues how i can make not parse on a single & for that page, but to parse for example on 2& in a row only ? but found it a bit confusing. 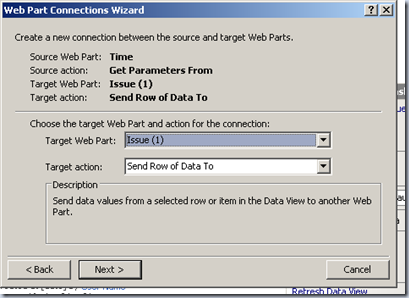 Do I need to edit both the newpage and the original dispform with the code? I tried only changining the newform and still received the same error. Do you have any plans on incorporating the information contained in the new link you provided into your video remix of creating the parent/child relationship? 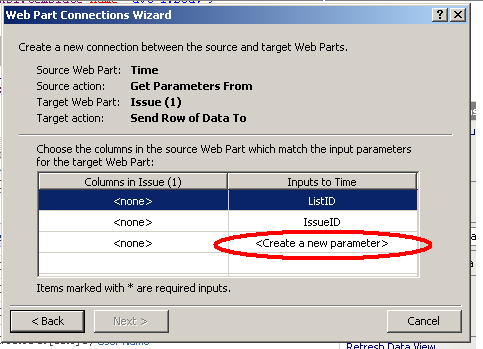 I still find this a bit confusing and continue to receive errors after incorporating the code into the newform.